Pros: Wonderfully creative storytelling, from a versatile and talented cast. A highly imaginative, moving and poignant drama. 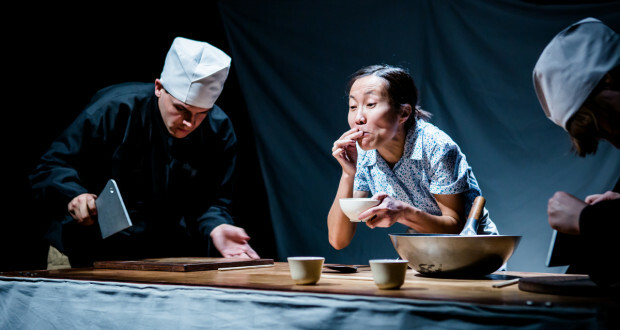 The Flying Roast Goose tells the tale of a Cantonese chef (Paula Siu) living in 1940s Hong Kong, whose cooking companion is her pet goose. As war begins to tear their city apart, we follow the pair as they struggle for survival. 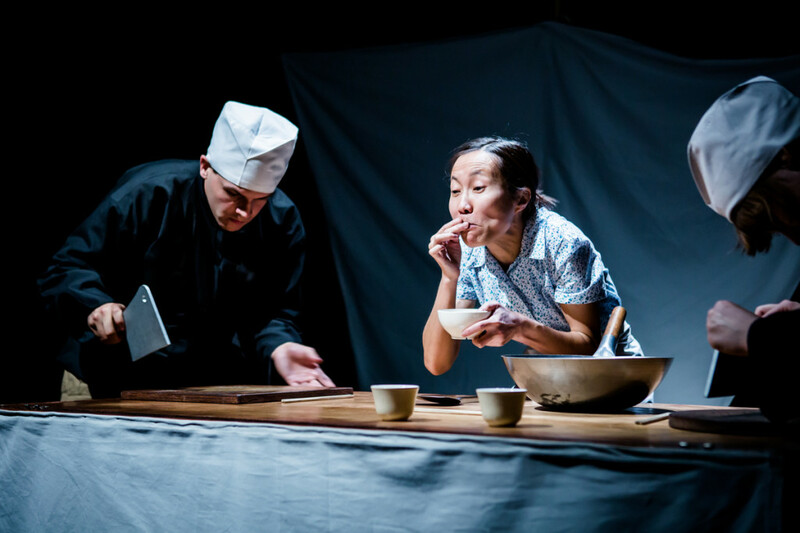 From the moment I walked into the Blue Elephant Theatre auditorium, it was apparent that the idea of Asian cultural identity was an important part of this play. The set featured recognisably Eastern influences including an elegant bamboo and cloth backdrop, a wooden handcart and traditional kitchen tools, including a wok and chopsticks. These cultural references continue throughout the play’s uniquely creative delivery. Particularly mesmerising are the ‘shadow’ sequences in which silhouette cutouts play out behind an illuminated cloth. The striking visuals of these sequences, combined with the music choices, create a strong sense of not only contemporary Asian culture but also its history and its traditions. 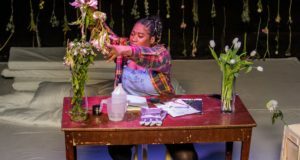 Using the backdrop of World War II, the play juxtaposes ideas around love and friendship, with images of oppression and loss. What is incredible is the impact with which these themes are delivered, through the unlikely narrative of a chef and her goose. 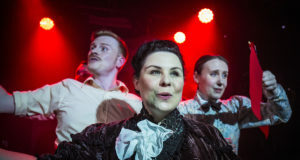 The storytelling is beautifully executed, using a mixture of traditional acting, mime, slow motion sequences, puppetry and prop manipulation – all from three incredibly versatile performers. Besides Siu, Jane Crawshaw and Kristoffer Huball take on the multiple roles of supporting characters, stagehands, and puppeteers. All three perform their roles flawlessly, moving seamlessly from one position to the next and never missing a beat. Siu’s portrayal of the chef is especially moving. Interestingly, much of her performance is delivered without dialogue and when she does speak, it is often in Cantonese. Despite this, the character’s experiences are communicated with unwavering clarity without needing to understand the language. Perhaps most surprising to me, was the portrayal of the goose. I had expected the puppeteers to be disguised in black or hidden behind a screen. They were however, fully visible throughout, allowing the puppet to move freely around the stage. What really amazed me was that, despite their visibility, after just a few minutes, they seemed to disappear completely. The wooden puppet is moved with such life and emotion that it becomes an entirely believable character in its own right. The emotional gravity communicated by this wooden goose is so strong that it received louder applause than the hugely talented performers behind it! Funny, quirky and beautifully delivered, above all this piece is an example of great creative versatility. A wide range of techniques is used, making for a visually interesting and entertaining production. The themes and story are emotive and universally relatable. At just 70 minutes in length, this is a small-scale production with a huge amount to offer. Well worth a visit. Devised by: Out of Chaos. Puppet Co-Directors: Robin Guiver and Oliver Smart. Dancer, reptile owner and freelance writer. Hanna spends her time copywriting for client projects and caring for her alarmingly needy pet lizard, Dante. Once Dante is fed and watered, Hanna enjoys John Waters films, fast roller coasters, pizza and the music of Meatloaf. Growing up treading the amateur boards, her finest thespian moment was painting herself green as the witch in Rapunzel. All types of theatre are embraced, except for expressive modern dance which is welcomed politely, at a distance. She particularly likes dark comedy and anything which is memorable.